No matter the size of your project, our animal lovers are sure to find affordable Ranch Rail fencing to suit any size project. 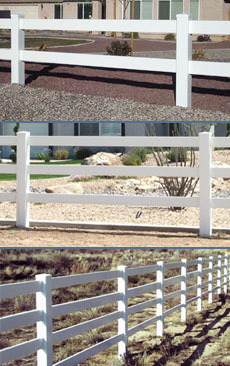 Our Ranch Rail fences are superior to home improvement mega-stores, offering the absolute best in maintenance-free fencing. Not only do they provide containment for your horse or cattle, but you may have seen these versatile fences around public and professional buildings, as well. Any quantity of rails fencing is sure to be excellent for large properties looking to enhance their horizon overlooks and landscapes. Available in three rail quantities to meet all your bordering and security needs without sacrificing beauty, now or over time!